Strange. Are you able to download the app from Github and run it from the CLI? How many devices do you see in the devices overview on the settings page? After a PTP, still no luck. Sure, I can CLI ! 2018-03-13 16:29:35 [log] [Heimdall] Enumerating devices done. Please post the log above that here. I downloaded and installed the latest version via CLI. I did not see a scroll box/handle.... sorry! no problem, glad it is working as expected. When the alarm is triggerd the sirene is going on. What I then want is the siren to go off after 5 minutes, but not if there is still a trigger to set the alarm (movement). And when the sirene did went off, it has to go on again if there is a alarm trigger. In the flow that is trigger by the alarm the sirene goes on and again off after 5 minutes. But when there is a alarm trigger it does not goes off again, because the alarm is still active (of course). So I installed a new flow that unsets the alarm after 5 minutes. But obviously that flow should first check whether there is no trigger active for the alarm. What is the easiest way to do this? I do not want to check all devices seperately. You're right that there will not be a new alarm triggered when the alarm is active, this is by design. If you want to switch off your Sirene but want it to be activated again when a new trigger (movement or door opened) is generated you will have to make sure Heimdall will accept this as a new trigger -> the previous Alarm will have to be cleared. This can be done by using the Deactivate the alarm action card in the same flow (perhaps with a slight delay) as where you turn the Sirene on and off. This way any new trigger will be seen as a new trigger and will activate the The alarm is activated trigger card. If you combine this with a low Disable motion alarm after/Motion Alarm Cancelation (the description varies per brand) timer on the sensors this will very likely give you a new activation of the flow that fires the Sirene. Please do keep in mind that this will result in a unreliable display of the Alarm state! So decide for yourself if you want to do this! Thanks, I will try it. And off course is will result in a unreliable display of the alarm state, but if I'm away for a long period, than only the first time the sirene will make some noise. The rest of the periode everybody can come in and out without the sirene making some noise (or do I see something wrong here?). You're right that if you're away for a long time only the first time there is a trigger the Sirene will go off unless you deactivate the alarm state. But don't you send some form of a push message to your phone? I'd rather be informed by a push message so I can take appropriate actions and then deactivate the alarm state manually on my phone than having that done in a flow. That way the next trigger will still activate the Sirene and I'm aware the alarm went off. Great stuff - will set this up at the weekend! Does anybody has some tips to give a person temporary access to enable and disable the alarm without using the app? In my other house I've used Woonveilig that has a remote to enable and disable the alarm. Hi, after the update 1.0.6 im getting an alarm when the ap noticed a tamper issue. know we know that the fibaro v2 door sensors are having a tamper issue. is there anything what i can do because now i'm getting an alarm in the middle of the night and there is nothing wrong accept the tamper iseu. Hi, I was having some problems with the delay. I am using the Dutch version and i discovered there is a translation fault. The partial and complet delay are switched. Can You please fix it? provide them with a card with NFC chip in there? or use any of their cards? Not sure if this is Heimdall or Fibaro. Only just noticed this. This happens for every movement detection. Could this be a heimdall thing or should i search in the Fibaro corner? Perhaps a (z-wave) keyfob and attach flows to it to set the Surveillance Mode? That mimics your Woonveilig system I'd say. Hmm, I was under the impression Athom fixed that... Unfortunately I have no solution at this time, I will include a setting to use/not use tampering and hope Athom will approve it fast. Oops, thanks for reporting, fix will be included in the next version. Heimdall reports what sensors send, I also have one sensor that keeps reporting 'no motion detected' without a previous report of motion. 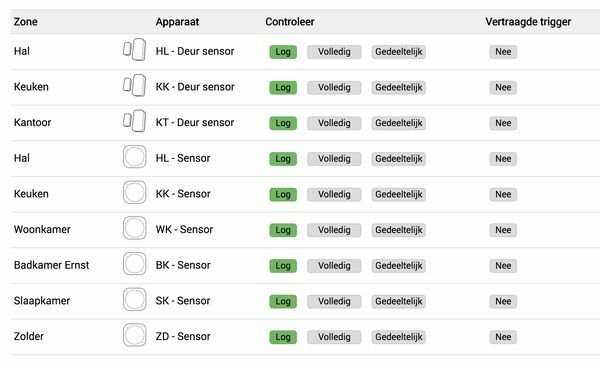 The setting Do not log deactivating of sensors (Log het deactiveren van een sensor niet) is available for that. New version 1.0.8 has just been submitted for approval by Athom. I saw in homeydash on the alarm tab that it is going to work with heimdall. how far is the integration from heimdall? Thanks, i will wait for the update. Hi can Heimdall use the vibration sensor in Aeotec Multisensor 6 or just motion detection? Yes, if you enable the appropriate setting shown in the post above yours. I suggest you read the first and second post from this thread, it will help you understand what Heimdall can do. It’s being worked on, We’re not in a state to give any predictions when it will be available. DaneeDeKruyff Thanks for your suggestion. That's exactly what I did, but I didn't see any reference to vibration sensor on the first two posts or the one above mine/ (Vibration sensor is not the same as tamper detection).